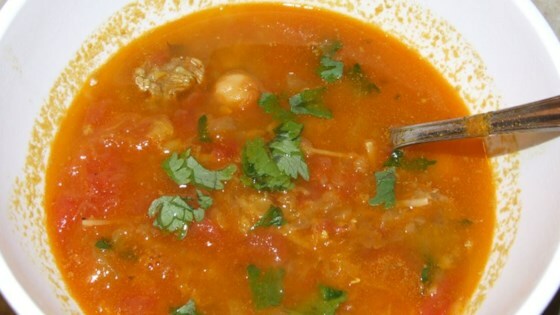 "This is the soup that Moroccans traditionally use to break the fast every night of Ramadan. Season with salt, pepper, mint leaves and cinnamon to taste." Place the lamb, turmeric, black pepper, cinnamon, ginger, cayenne, butter, celery, onion, and cilantro into a large soup pot over a low heat. Stir frequently for 5 minutes. Pour tomatoes (reserve juice) into the mixture and let simmer for 15 minutes. Pour tomato juice, 7 cups water, and the lentils into the pot. Bring the mixture to a boil, then reduce the heat to simmer. Let soup simmer, covered, for 2 hours. About 10 minutes before serving turn the heat to medium-high, place chickpeas and noodles into the soup, let cook about 10 minutes (until noodles are al dente). Stir in lemon and eggs, let eggs cook 1 minute. This is delicious and very easy to make. I did mine without the pasta and it was great. My only suggestion is to add more lamb...it got a bit lost in the stew.